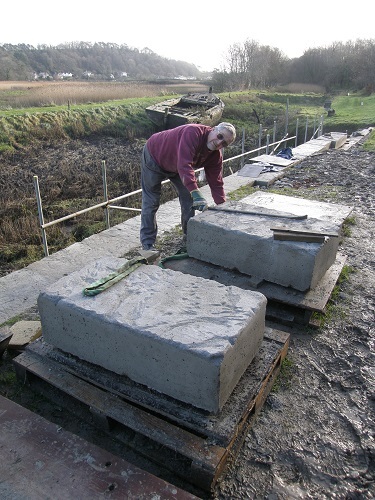 While Adrian warms up the engine and clutches of the RB, Trevor organizes lifting strops for moving the two most recently cast coping stones onto the wharf wall. When Adrian begins tracking the crane to the position it needs to be in, the offside drive chain decides to slip off the rear sprocket. 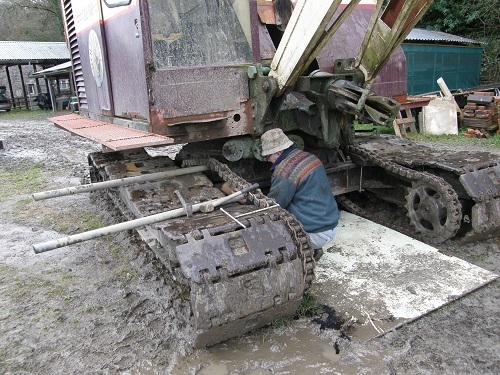 Despite attaching sacrificial blocks in attempt to take up the slack in the drive chains, the glutinous mud on the surface of the site has helped enable the chain to slip free. Trevor applies a very large bar-iron to the loose chain and manages to get it almost back onto the sprocket but not quite. Eventually while Trevor is applying leverage to the chain, Adrian engages drive again and very slowly reverses the crane slightly which pulls the chain back on. 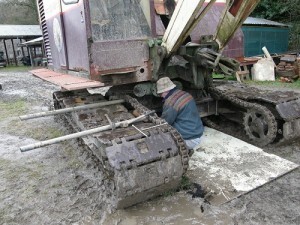 He then continues to drive the crane to where it needs to be in order to lift the blocks. The first block is quickly lifted on to the wall and levered into its final position. The second soon follows suit. Trevor mixes a load of mortar whilst Adrian selects a number of suitable stones for in-filling the space beneath the blocks. 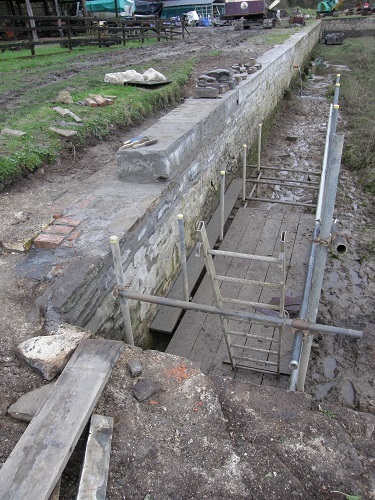 Once this is done and the stones mortared in, Adrian continues rebuilding the top of the wharf wall and by the end of the day has reached the end of the straight section. To finish this section of wall, another 2 coping stones are required but their production will have to wait for another day. 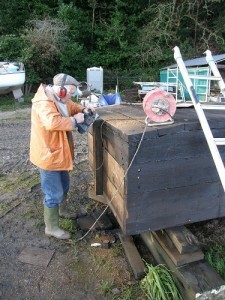 Adrian had been hoping to complete rebuilding the length of wharf wall as far as the corner section before the end of 2013 but here he was on the last day of the year, working with Norman, craning more block onto its top. Having roughly laid these blocks in place Adrian estimates he needs 4 more to finish. 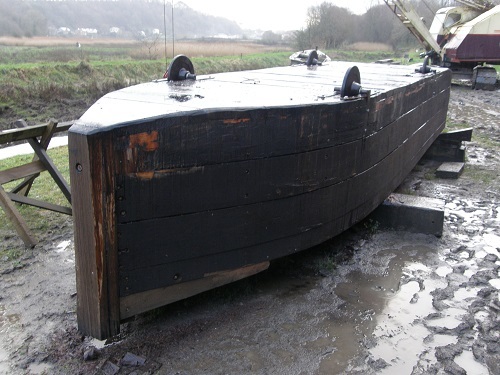 Then he plans to begin building a launching ramp/inclined plane which the tub boats and other small craft can use to enter or exit the water but this is for 2014, not so far away now! However he is well pleased with the point of progress reached so far . As a matter of fact, to date, 120 ‘coping stone’ blocks, including 7 quoin ‘stones’ and 5 foundation blocks, have been cast which has taken whole a load of concrete. Although it has stopped raining for a moment the surface of the site is still an absolute mess. Driving the RB up and down shifting blocks has not helped but this is unavoidable. While Norman and Adrian are playing with big boys toys, Barry has been using an electric planer to chamfer the edge of the base of the lead tub boat. The wheels and axle straps are already to be attached but that will also happen next year now. A VERY HAPPY, HEALTHY AND PROSPEROUS NEW YEAR!